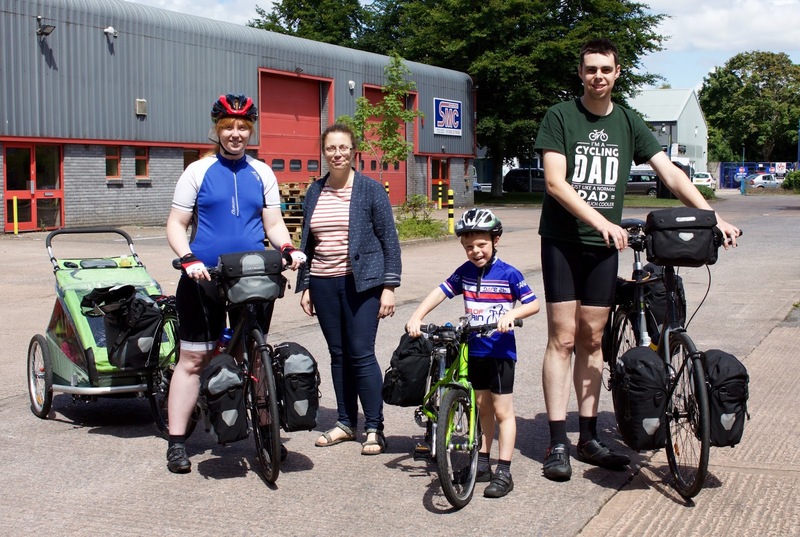 Knock on delays from our journey down the M5 on Friday saw to it that it was rather later than we'd have liked when we finally bid farewell to our friend Ruth and set out by bike from her warehouse on an industrial estate in Exeter, bound for France. I'd diagnosed the broken spoke before I'd had chance to pull up, and call to Thomas Ivor to wait. It had failed some way out from the hub - apparently a tensile failure rather than work hardening of the bend at the end. I started to walk into Dawlish Warren, texting Ruth, whilst Katie stopped to call the bike shop in Dawlish. 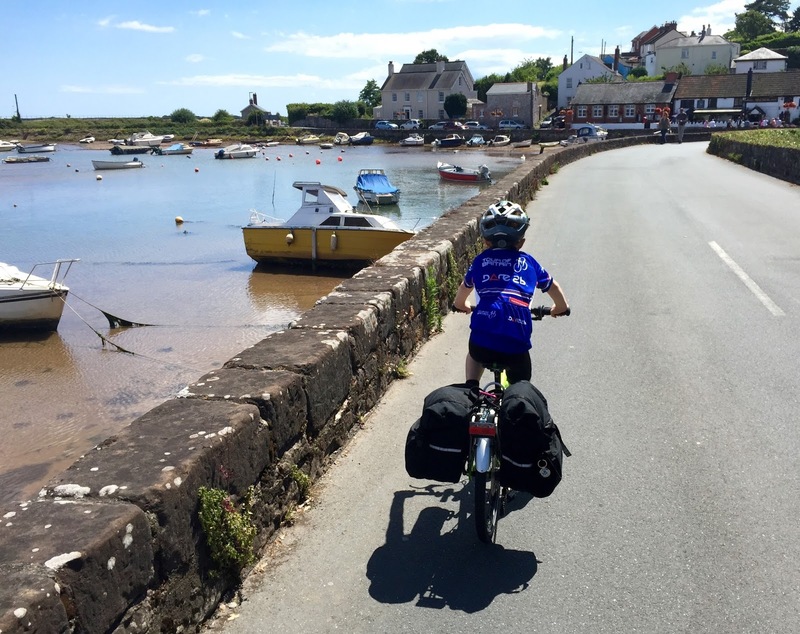 We were glad Thomas Ivor had taken the time to sit with Ruth and mark up the map with bike shops whilst we'd been loading panniers in the morning. The 'walk of shame' through the Warren, as I cursed my having said only yesterday that we were 'due a mechanical', reminded me just why we do what we do on holiday. People with few clothes and many tattoos, poorly behaved dogs and children, carrying cheap-jack inflatables and the spoils from the arcades. I reckon I would sooner visit hell itself than spend a week in a static caravan in Dawlish Warren. What they would make of our kind of holiday, one can of course only conjecture at! Approaching Dawlish, Katie passed me and said that the bike shop hoped to be able to sort us out. She pressed on; having identical wheels to me, she would be able to give them a head start on what spec spoke we needed. No sooner had this information been imparted than a text message from Ruth came in, to say that she, too, had spoken to 'Bob' and we were in good hands. It was so encouraging to know we had someone to introduce us in that moment. Saturday afternoon isn't the best time to break down, even without a boat to catch. It was frustrating to walk into Dawlish, but I wasn't taking any chances with the wheel when I was so close. We could well do without further failures, and in any event I was now worrying about the wheels generally. Once one spoke has gone, who knows what the others are like! 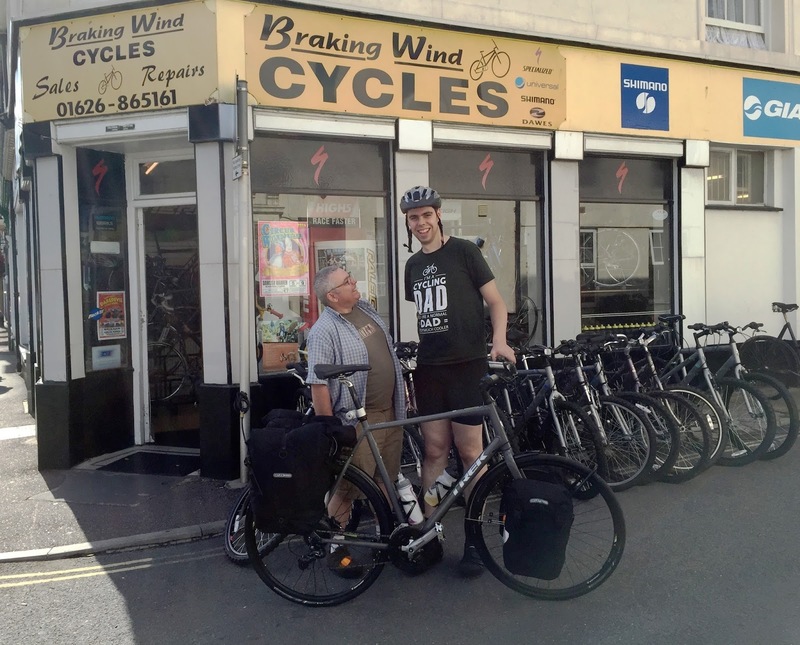 Nevertheless, spirits lifted as I arrived at the shop, 'Braking Wind Cycles' - something of an understatement if you were to describe my inward disposition! Thomas Ivor was glad to stop walking. Bob won't mind me describing him as a small chap, I feel sure, since it was he who pointed it out! 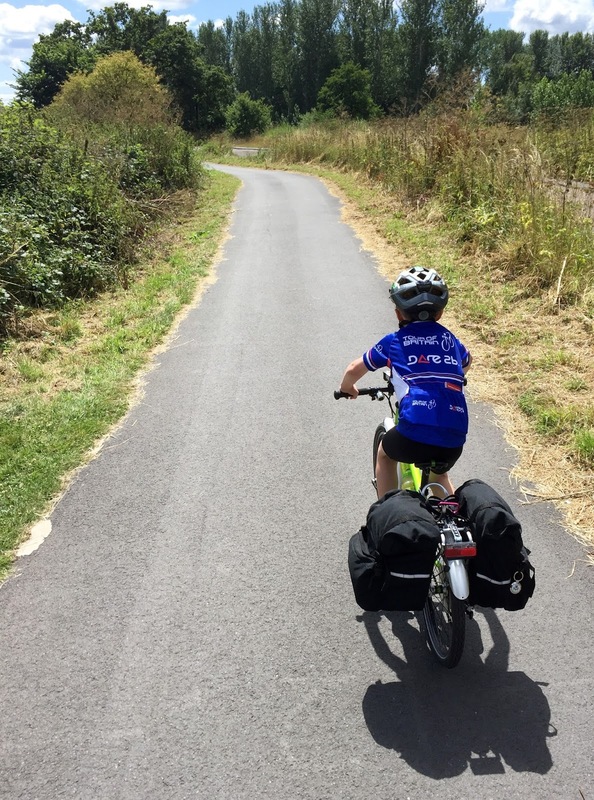 What he lacked in height he made up for in enthusiasm, tempered with natural concern about the weight on our bikes and the failure we'd suffered. He told us to take a rest, to wander into town and get something to eat and drink, let the girls out, and if he needed us, he'd come and find us. I left my bike and my panniers, and we did as we were bidden. Sat amongst those for whom Dawlish was their holiday destination, not an unwelcome and premature stop en route, we got the girls, and the ball, out. It seemed wrong. I am no wheel builder, but despite being pretty much useless I felt awful not being with my wheel whilst it was on the operating table. We have a lot of miles to cover together, yet, and although this is the first such failure in hundreds of miles since we bought the bikes, which we were assured by the Trek dealer would cope with the load, I will carry this worry for the rest of the trip unless a new wheel presents itself. It was time to call our hosts for the evening. No way were we going to make it to Ashburton for our planned arrival time now. Toby, it turned out, is a man of many bikes and almost as many trailers. 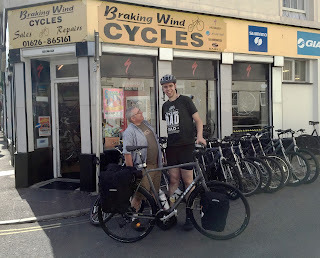 I figured that by the time he had got rolling towards us, as he kindly offered, we could make it to the quay car park at Teignmouth, and put some modest distance on the repaired rim to see if it settled, so that's what we did. Bob swapped out the failed spoke, I had a quick run round the block to check all was well and we got rolling once more. The main road out of Dawlish begins with an evil hill, on a busy and narrow stretch, and I must confess I had forgotten just how many times the road went down and up again between the two towns. It's no wonder Brunel put his railway where he did! 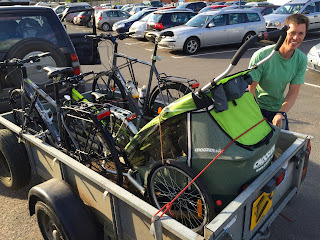 I do hope Toby hadn't been waiting long as we rolled into the appointed car park to find a 4x4 and a trailer big enough to take our entire outfit, with a friendly fellow cyclist at the wheel of the ensemble. A long evening's ride and a big hill had been averted thanks to the kindness of strangers. 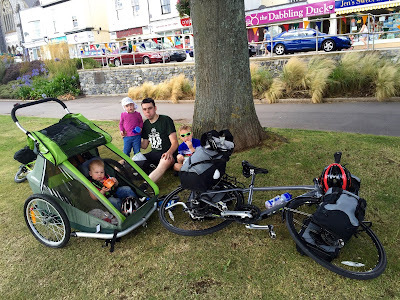 Toby, Nicky and their little boy John are another cycling family, with a wealth of experience on two wheels, and it's been affirming to meet likeminded people so early in our trip.